Pauline Elvira Bush (May 22, 1886 – November 1, 1969) was an American silent film actress. She was nicknamed "The Madonna of the Movies". Born in Wahoo, Nebraska, Bush was "brought up for the operatic stage and concert platform, [but] she preferred the stage." She studied at the University of Nebraska after attending a private school in Virginia. At Nebraska, she studied "music generally, and the piano in particular." After she moved to Los Angeles, Bush studied expression and literature at the Cumnock Institution. Early in her career, Bush was active in stock theater at the Liberty Theaer in Oakland, California. Her film career began with the American Film Manufacturing Company. From 1910 to 1924, she appeared in some 250 movies, dozens of them featuring Lon Chaney. 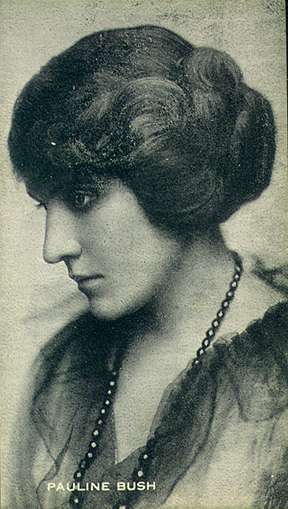 Bush married director Allan Dwan in 1915. They divorced in 1919. In 1928, Dwan offered a lump sum settlement of $200,000 to Bush in lieu of continuing $26,000 annual support. The Associated Press cited a story in the New York American that said that Bush had "filed a claim for $100,000 back alimony." On November 1, 1969, Bush died of bronchitis and cancer in San Diego. She was 83. ^ "Pauline Bush, Famous Universal Film Star, Pronounced by Critics as Most Versatile Actress on the Screen". Vicksburg Evening Post. Mississippi, Vicksburg. April 28, 1915. p. 5. Retrieved August 3, 2017 – via Newspapers.com. ^ a b Grau, Robert (1914). The Theatre of Science. New York: Broadway Publishing Company. p. 378. Retrieved 5 August 2017. ^ a b c Katchmer, George A. (2009). A Biographical Dictionary of Silent Film Western Actors and Actresses. McFarland. ISBN 9781476609058. Retrieved 4 August 2017. ^ a b c Willis, Richard (September 1914). "Pauline Bush, of the Universal Company". Motion Picture Magazine: 93–95. Retrieved 5 August 2017. ^ "Pauline Bush Dwan Will Press Claims Against Former Husband". The Salt Lake Tribune. Utah, Salt Lake City. Associated Press. June 21, 1928. p. 9. Retrieved August 3, 2017 – via Newspapers.com. ^ Wilson, Scott (2016). Resting Places: The Burial Sites of More Than 14,000 Famous Persons, 3d ed. McFarland. p. 106. ISBN 9781476625997. Retrieved 4 August 2017. Wikimedia Commons has media related to Pauline Bush (actress). This page was last edited on 3 January 2019, at 06:58 (UTC).